A valuable and individual companion for successful and satisfying work. Also ideal for groups and teams. Format: A6, 8 pages, folded. This pocket guide has been created to ensure that corporate values and visions do not just remain well formulated words. It can and should be used by the executives and employees themselves to write down the corresponding corporate visions, philosophies, principles and values. The priority values of the work colleagues for smooth cooperation can also be written down. Conflicts become easier to avoid and work is more fun. What’s more, if visions and values etc. are not yet available, this guide also lets you develop them together for your team, while the handy size means everything that matters is always to hand and portable. In this way, the contents can be discussed by everyone in a quiet moment, during a break or in preparation for a discussion. • Overview "80 constructive action values"
"Pocket Guides" are valuable, personal companions for successful and satisfying work that can be used in a variety of ways in companies of every size. They give business people, HR managers, executives, consultants, trainers and coaches a compact structure that enables them to convey the value set of the company or team to which present or future employees belong/will belong. 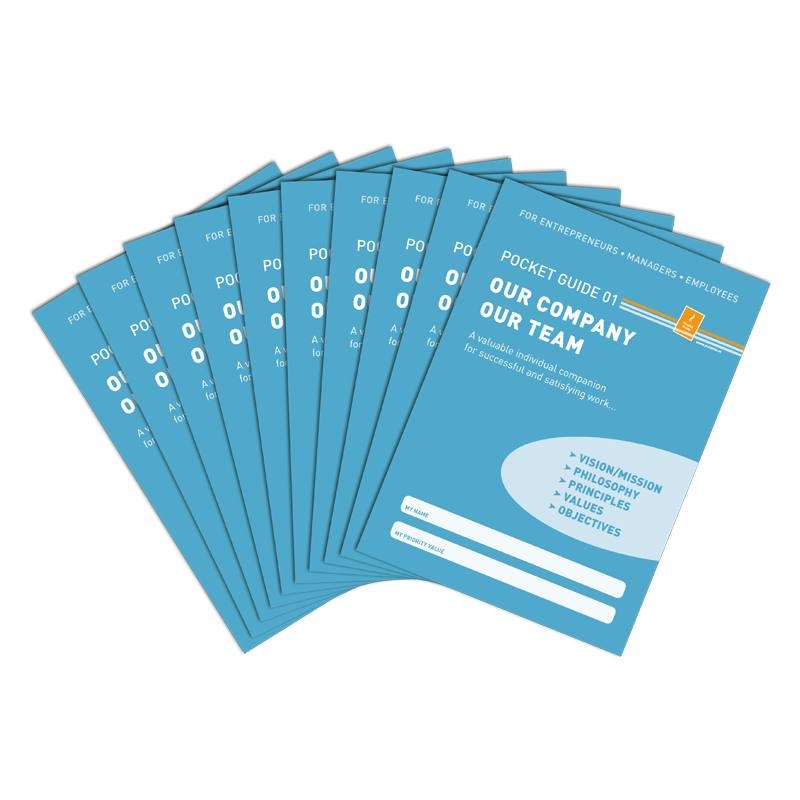 "Pocket Guides" can be used as a supporting tool in employee orientation meetings or as part of recruitment processes of HR development measures. For new employees, they also represent an efficient way to explain the values that the company and team are based around and which it views as a prerequisite, quickly and for the long term. 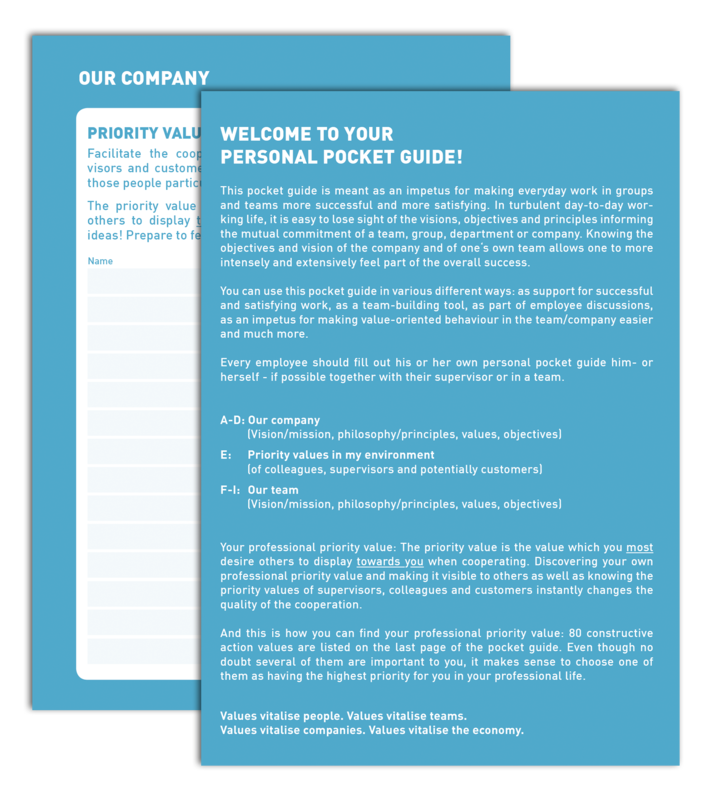 Each employee gets their own personal "Pocket Guide", which he/she fills in personally (e.g. during a meeting or a group event) and can then keep and build on (priority values). The "Pocket Guide" motivates employees to actively develop a better sense of the values of colleagues and customers and thereby work better, with less friction and greater success. Other "Pocket Guides" on other topics are being developed and will also be available here soon. We wish you lots of fun with this innovative product! 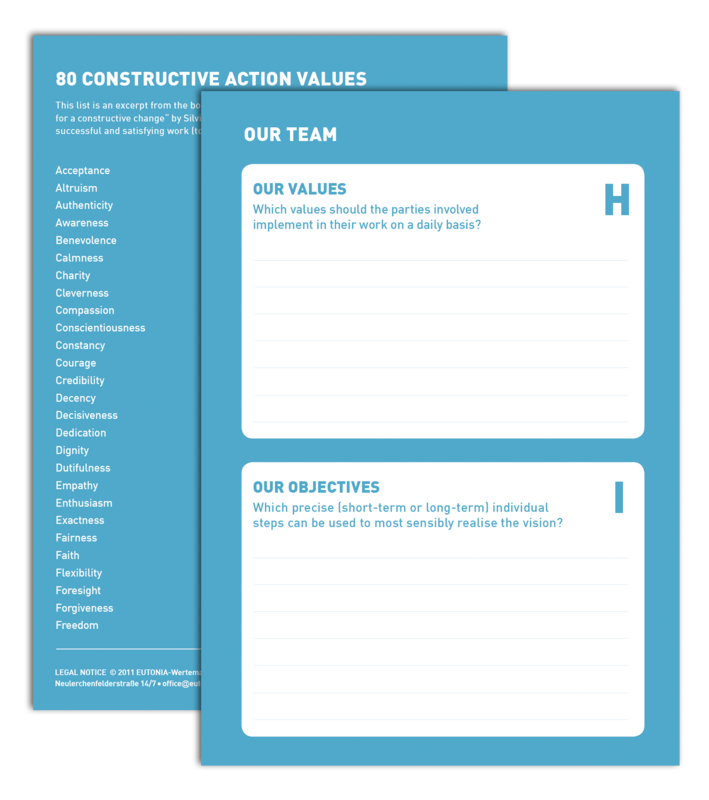 • can be expanded with the values cards "Priority values".